If you’re getting all the responses you’ll ever need on the 1st email you send to prospects, let me know. You’re a walking, talking miracle worker! If you’re like the rest of the sales world, and need to send several follow-up emails to get a response, this one’s for you. Never, ever forget that leads are people. They value their time, care about their privacy, and don’t love being interrupted with unsolicited sales pitches (most of the time). They’re smart too. But just like the rest of us, they tend to make decisions based on emotions, as demonstrated by behavioral economics. Few leads will respond promptly and favorably to your outreach. But with strategic and authentic lead nurturing, enough of them will see the value you provide— with a little personalization and patience on your part. If you only send mass email campaigns, leads might feel like they have a stalker who is not detail-oriented. That won’t get you very far. On the other hand, you won’t cover enough leads to meet sales targets if you personalize every email individually. Instead, group your prospects by their persona, and personalize to that. Committing to a strong follow-up email sequence is one thing. How you approach each step in that sequence matters too. You should have a clear next step you’d like to achieve when you follow up and understand what your prospect would want to achieve too. Find a reason to speak with them that serves both purposes and clearly communicate that in your email. For example, using the phrase “just checking in” is usually discouraged by sales leaders. It’s even worse if you’re checking in without offering anything new that’s valuable to the prospect! If all Ben wants is to talk, he just needs to ask for that, and tell me when he’s free! I at least deserve an idea of why we should speak. Keep them short, sweet, and straight to the point. Be casual and personal. (But don’t say anything you wouldn’t say to your grandparents). Reference the prospect’s company and/or name. Use a simple call to action. Now, I know it can be tricky to put that advice into practice, so here are some examples you can play with. These aren’t one-size-fits-all example subject lines, so make them your own! Warning: Great subject lines are not enough. If you’re getting improved increased open rates, great. Now turn your attention to reply rates. If you’ve gotten a prospect’s attention, you’ve got a new challenge: keeping it. The key to writing great follow-up email copy is to be valuable and relevant as quickly as possible. This 3-item checklist should help make your efforts worthwhile. 1. Personalize. You are engaging a person, not a robot, so extend all the respect and attention the email recipient deserves. Even if you are using a marketing automation software, ensure that your emails do not sound automated, generic, or irrelevant. However, make sure that you are personalizing in a thoughtful way. Just referring to someone’s title, work history, or the school they attended just proves you can do basic internet research. It doesn’t tell them you took the time to really understand them. For example, you could instead reference content the prospect has personally written, something unique to the prospect’s industry, or recent news about the prospect’s company. According to Outreach SDR Manager Sam Nelson, you can execute personalization at scale through a combination of personalized and automated messages. For example, personalizing just the first two sentences of an email can deliver a dramatic increase in open rates. Bottom line: understand your buyer persona and fine-tune the message in a way that makes your value proposition shine. 2. Go for short and sweet. Don’t go beyond what’s necessary to generate a response from the recipient. Get straight to the point, and plainly state the email’s purpose at the onset. Then quickly offer up unique personalized value and end with a simple, clear CTA. If you can’t catch the prospect’s attention during the first few seconds, it’s unlikely you’ll get a response anyway. So avoid getting too wild and creative, or spinning a long tale. 3. Provide relevant value. They key word here is relevant. Your marketing department’s latest ebook might be valuable, but make sure it directly addresses your prospect’s main concerns. One example: if the recipient recently attended a conference or trade show, follow up by citing event highlights or attaching resources. Make sure whatever you share relates to the prospect’s business, activities, interests, or problems. Or, you can mention newly published news or trends that impact the prospect’s company or industry. You’re following up because you want the email recipient to sign something (eventually). For that to happen, the prospect needs to make a series of decisions that result in a purchase. Including CTAs (calls-to-action) is what allows you to connect the present with that future scenario. Any sales email is useless without a clear CTA. Regardless of what you would like the next step in the journey to be, make sure it’s also compelling to your prospect. Short and direct is better. Automation makes it easier to craft, send, and track sales-related emails. While a one-to-one correspondence is ideal, sales is a numbers game. New tech can help find the happy medium between massive scale and heavy personalization. There’s no absolute rule on how soon you should send a follow-up email. It all depends on the context and finding the sweet spot between keeping the deal moving forward and stalking/ spamming the prospect. You should have agreed with your prospect ahead of time on an appropriate follow-up time. That way, there’s no guesswork involved. If you weren’t able to do that, or just haven’t spoken to the prospect yet, here’s a rough guideline to consider. Sending follow-up emails at different times of day and different days of the week improves your chances of getting a reply. That way, you’re not always sending the email at a bad time for the prospect, like on Tuesday afternoons when she attends a live six-month training program. Obviously, there’s no one-size-fits all solution here. A controlled trial and error approach will help fine-tune your team’s email effectivity and maximize impact. Again, the best answer is “it depends”. Your relationship with the recipient, their decision-making authority, and stage in the buyer journey all matter. Sales experts disagree on how many follow-ups is an effective number, too. A joint guide published by Ambition and SalesFolk successfully used an 8-touch sequence composed of a cold email and 7 follow-up emails. Meanwhile, Close.io’s Steli Efti recommends a maximum of six follow-up emails for completely cold prospects. That’s not the case if you’ve had some form of interaction and the lead doesn’t ask you to stop emailing them. Then, Efti says you can and should send follow-ups until you get a response one way or another. Note: This is an extreme example that worked for Efti. But you should never treat templates or tactics as dogma. In sales, contexts are never identical. Even if a situation featured here sounds similar to yours, treat your selling situation as completely unique. Plus, a model or template that proves to be effective today may not deliver the same outcome tomorrow. You can be relentless but sometimes, there’s a point where you’ll have to stop. Email outreach requires time and resources to get done even when you are using smart tech to make it more efficient. If you have tried all the hooks in the book, it’s time to let go. A little attrition keeps the pipeline cleaner and allows you to focus on engaged prospects. Send a courteous break-up email that leaves the prospect a final chance to respond. End with a jolly farewell knowing that you’ve tried your best. And of course, leave a link to the resources you think will resonate most with the recipient (just in case). So you ran your sequence, and you got some replies. Other’s didn’t even open your emails. That’s not the end of it! Even if you don’t get replies, you can get value from your efforts. Monitor your campaign, analyze email data, and document what you’ve learned. You’ve just made all your future efforts more efficient! Consider using email tracking and analytics software, which help elevate performance. If it’s possible on your platform, run A/B tests, too. Which emails drove the highest reply rates? Did those replies correlate with deals that closed/won? How many follow up emails did it take to get your desired action? Does your sequence work better for some prospect personas than others? 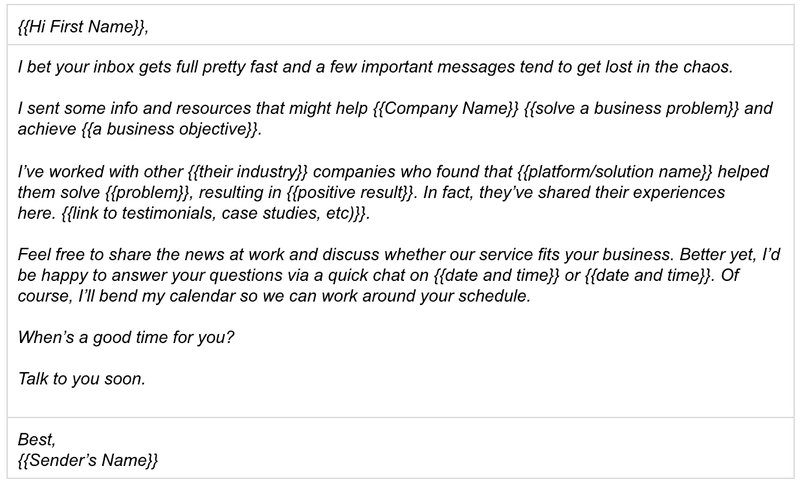 To help you jumpstart your email follow-up efforts, here’s a runup of useful templates that you can use. As you try these out, use A/B tests to identify which work best for your business and prospects. Then, try some new ones of your own. A. Sample follow up email to a prospective client. B. Follow-up sales email after a meeting. C. Follow-up email after no response. If you’ve already had a meeting with this person, you can add more of a Challenger element here. D. And since it happens a lot, here is another follow-up email sample you can send after no response. E. Generic sales follow-up email sample after a touchpoint. F. Follow-up sales email after an event or trade show. G. Break-up email sample after another follow-up. I began by saying that “just checking in” is a bad idea. Then, I gave you lots of subject lines and sample follow-up email templates to use. But you should also know that a lot of the advice about follow-up emails is really untested. Plus, it depends entirely on your context, and your prospects. Case in point: the data science team at Outreach recently A/B tested the phrase, “just checking in”. They analyzed its impact on more than 4000 bump emails. The results were surprising, and went against all of the other advice we’ve heard. It turned out that using the phrase lifted email reply rates by as much as 86%. What’s the lesson? Use these templates how you like, but don’t treat anything like dogma. Contexts change and assumptions aren’t always what you expect. Conduct A/B tests to find out what works best for you and your prospects in each scenario. Colin is the Director of Marketing at Sales Hacker. Before that, he led the strategy team at a marketing agency, and worked with hundreds of B2B brands to build winning inbound strategies. Outside of work, Colin is the world's biggest dog lover, and spends as much time as possible outside.